I love treating my friends to homemade goodies. It’s one of the things I try to do on a regular basis, whether it is baking their favorite cupcakes for their birthday or showering them with jars of homemade jellies, salsas and pickles, it allows me to do something I love (bake and can) while hopefully making their day a little bit better. I’m lucky to work with one of my closest friends, Jenni. On Monday, Jenni returned to work after being on maternity leave for 8 weeks. 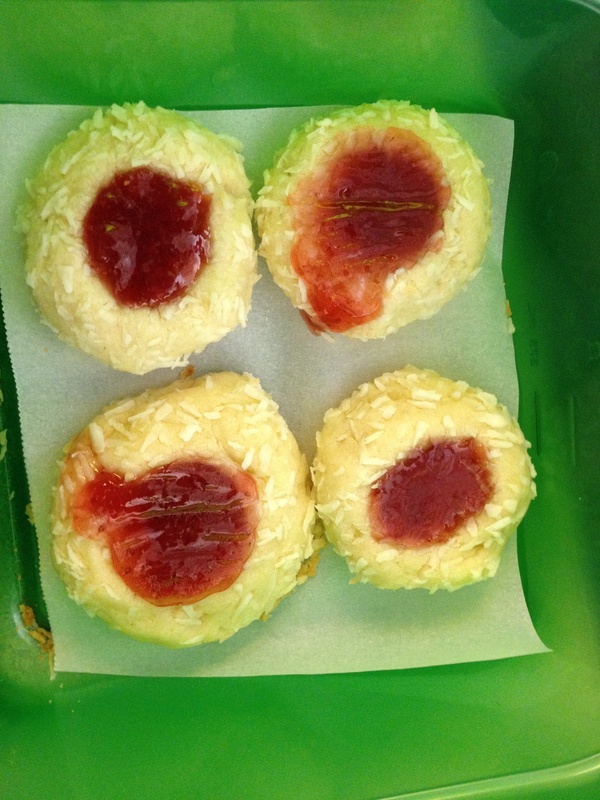 I’ve missed passing her in the hallway at work or popping over to her cube to chat with her during the day, so I decided I would welcome her back with one of her favorites – jam thumbprint cookies rolled in coconut. But there was a catch…I HATE making jam thumbprint cookies. The recipe that Jenni fell in love with a few years ago is hard to work with and the cookies crumble and crack and never look pretty – but I will admit, they are yummy, especially when filled with my homemade elderberry jelly. I make them every year at Christmas, just for her, and this year was no different. For her surprise, though, I decided to try a new recipe and see what she thought. I am supposed to be eating good and I have already had three cookies! The recipe is not as good but still gooooooooooood! I had to eat two more cookies so you could have a good picture. This recipe is one that I clipped last year and was in the pile to try or toss this year. They are definitely good enough to make again, but for Jenni, I suppose I can make the old recipe. However, I am going to take her up on her offer to go elderberry hunting with me this summer. It’s much more fun climbing into ditches along country roads when you can do it with a friend! And picking all of those little berries off of their stems will go much quicker with four hands instead of two! 1. In a mixing bowl beat the butter and cream cheese with an electric mixer on medium to high speed for 30 seconds. Beat in sugar until combined. Add egg yolk and vanilla; beat until combined. Beat in flour. Wrap and chill dough for 1 hour. 2. Preheat oven to 350 degrees (F). Line a cookie sheet with parchment paper. Shape dough into 1-inch balls. Roll balls in coconut. Arrange 1 1/2 inches apart on cookie sheet. Use thumb to indent each cookie. 3. Bake about 14 minutes or until edges are light golden. Cool on cookie sheets 1 minute. Use thumb to re-imprint cookies. Spoon about 1/4 tsp. jam into center of each. Remove and cool on wire racks.